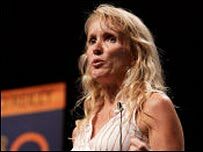 Prominent blogger Kathy Sierra has called on the blogosphere to combat the culture of abuse online. It follows a series of death threats which have forced her to cancel a public appearance and suspend her blog. 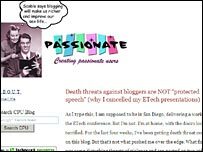 Ms Sierra described on her blog how she had been subject to a campaign of threats, including a post that featured a picture of her next to a noose. The police are investigating while the blogosphere has launched its own enquiry. One of the issues raised is the question of how women bloggers are treated online. Ms Sierra, author of popular blog Creating Passionate Users, began receiving death threats four weeks ago. Since going public on the issue, she has been overwhelmed by the support she has received. "I agonised about making this post but I hoped it would start a dialogue," she told the BBC News website. "I never thought it would become so big or be this positive," she said. While blogging feuds are common, she believes the campaign against her is more likely to be because she is a woman in the male-dominated technology world. It is unclear who the authors of the threats are but Ms Sierra said she was particularly disturbed that some of them were hosted on blogs that are authored by or owned by a group that includes some prominent bloggers. She said the campaign of terror has changed her life forever. She abruptly withdrew from a keynote speech she was due to deliver at the ETech conference in San Diego on Monday. "I have cancelled all speaking engagements. I am afraid to leave my yard, I will never feel the same. I will never be the same," she said on her blog. She said she was questioning whether she would ever post again, saying she did not want to be a part of a blogosphere where such threats could be made. Apologising to those expecting to hear her speak at the ETech conference, she called on them to enter the debate. "If you want to do something about it, do not tolerate the kind of abuse that includes threats or even suggestions of violence (especially sexual violence). Do not put these people on a pedestal. Do not let them get away with calling this "social commentary", "protected speech", or simply "criticism"," she said on her blog. Much of the blogosphere has rallied round in support of Ms Sierra. Robert Scoble, author of popular technology blog Scobleizer, condemned the campaign against her. In response, he has decided to temporarily stop blogging and has turned off functionality that allows people to post anonymously.